There are lots of interesting things to say about General Magic. For the original MagicLink, I worked on the communications infrastructure. That generation claimed to communicate with the AT&T PersonalLink service via Telescript, although the device itself had almost no real Telescript capability. There was quite an elaborate messaging infrastructure that included a proprietary reliable packet protocol, routing, authentication and encryption, etc. 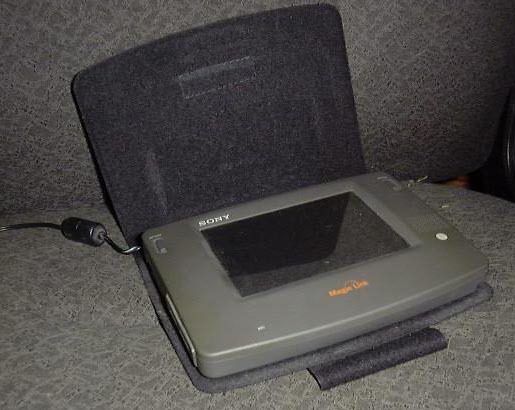 I worked on that on both the PDA and the server, but mostly on the server (Unix). I also worked quite a bit on the wireless infrastructure for the companion Motorola Envoy PDA. The second generation, which looked very similar, was somewhat more open. I did a TCP/IP stack for the PDA side, as well as some of the protocol underpinnings needed for RFC822 mail and HTTP. 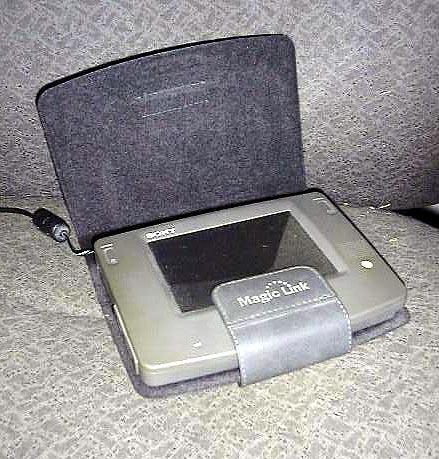 DigiBarn curator Bruce Damer notes: sadly, in September 2002, General Magic declared it would be ceasing operations, RIP for a lot of great technology and design! We also have a copy of Magic Cap for Windows 95 which we run for visitors. We will document this more in the future. 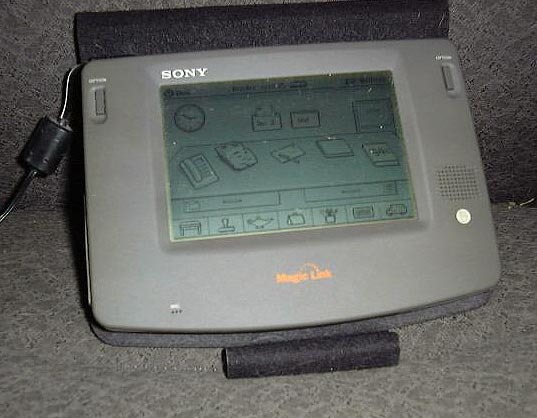 Years before Sony "entered" the PDA market with the Clié family of products, they released the Magic Link devices as an Apple Newton competitor. 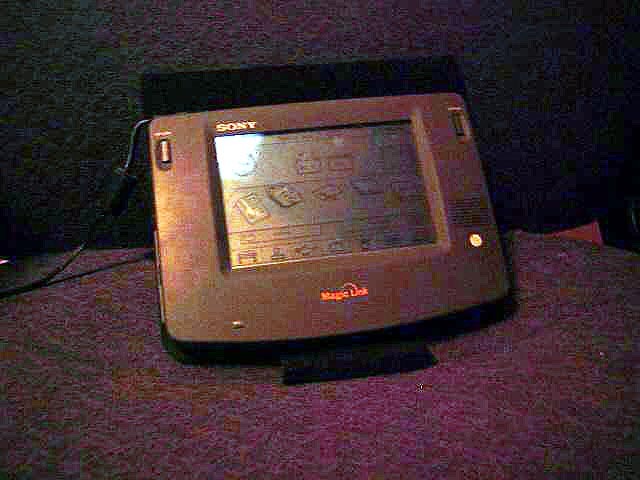 The feeling, back then, was that the PDA market would soon explode, and a war for the best PDA OS was engaged. 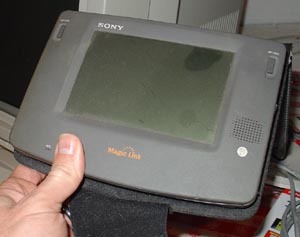 Apple had Newton OS, microsoft introduced the obscure "Windows for pen computing" and a company named "General Magic" created Magic Cap. 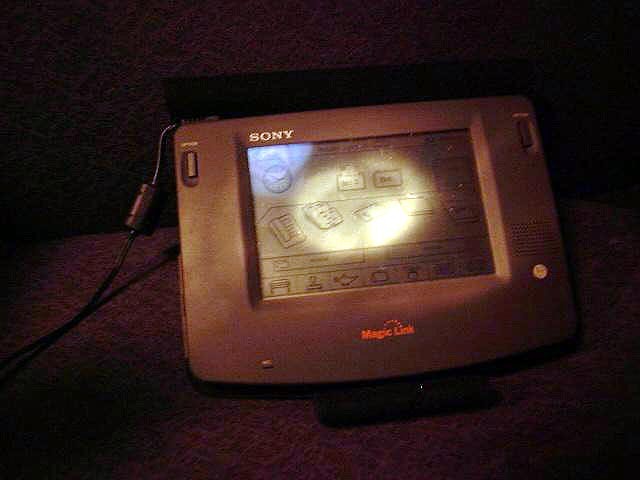 This is this Magic Cap OS that was chosen to power the Magic Link units from Sony. The unit in itself is an impressive piece of equipment : complete with a large set of connectors, it was mainly design as a mobile communicator, to which an optionnal cellphone module could be attached. With the wide 16 grey screen running the "massively graphical" Magic Cap OS, using the Magic Link is a real pleasure. Using the built in telephone port, the device can turn into a handfree telephone, which, if not very useful in most cases, is still a cool gadget! Now, although the OS is fast enough, very easy to use, and ready for network operations, the unit is now too dated to be exactly useful. First of all, the screen itself is bigger than a Palm (or Clié) device! Then of course; the device is ever bigger, although not too heavy. Then again, the virtual keyboard, appearing as the only text input system, cannot compete with a Graffiti system.